Way back in the dark ages of 2006, the Ancient One, TOM, foretold of a four-week celebration of the works of acclaimed anime director Hayao Miyazaki. And I thought, “why not?” So, the format is simple: 4 weeks and 4 reviews. Of course, there is way too much to cover in just 4 reviews. That is like asking someone to pick their top favorite Pokemon and then sentence the others to death. You can’t do it. It just can’t be done. So, to avoid getting my virtual face kicked in…polls will be open and you will get to vote on the movie featured in the final review post. In this post and the following ones, I will take into account film plot, animation, characters, and overall personal significance. 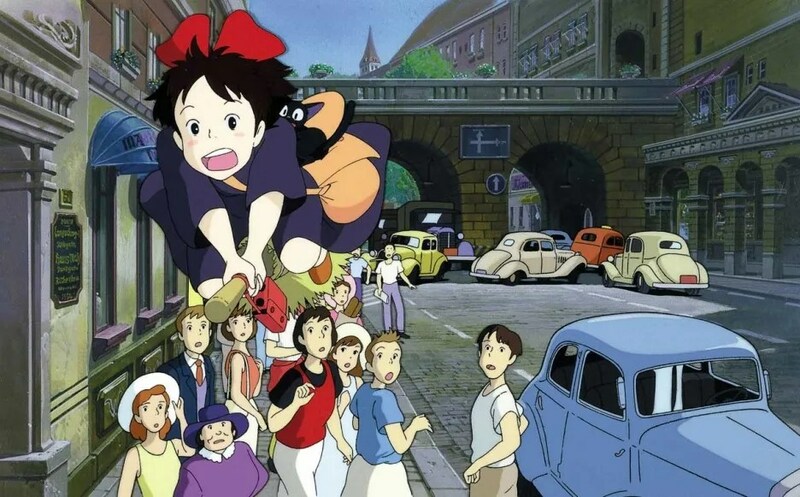 The movie that I have chosen to kick off this countdown–of my favorites, so everybody don’t mob up on me at once–is Kiki’s Delivery Service. My reasoning behind it is that it was the movie that first introduced me to Hayao Miyazaki and his work and for that, it had to be the first of this series. Kiki, a young witch-in-training, has reached the age of 13. According to tradition, all witches of that age must leave home for one year, so that they can learn how to live on their own. Kiki, along with her talking cat Gigi, fly away to live in the seaside town of Korico. 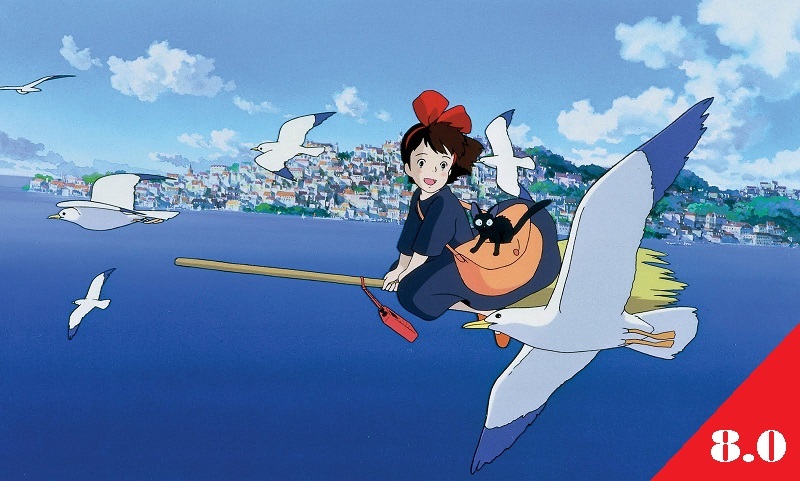 After starting her own delivery service (using her broom as the delivery vehicle), Kiki must learn how to deal with her new life, especially after she loses the power to fly. Legitimately, that was it. All of it. No M. Night Shyamalan-type plot twists. Nothing. 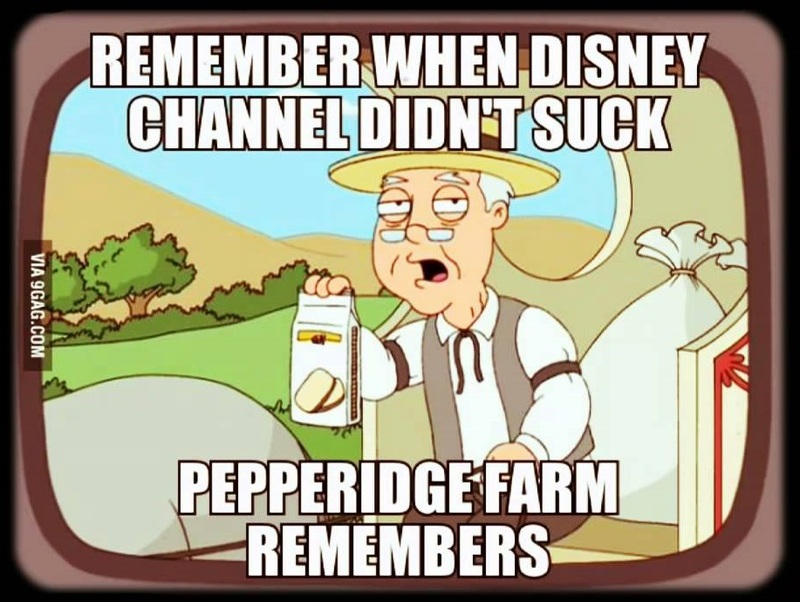 And that was okay because I was like 7 years old and one hundred percent certain that the first time I caught the movie, it was being shown on Disney Channel. The plot, like many of his other films, was very simple yet held a deeper meaning. It was one of those movies that you file away for nostalgic safe-keeping when you are a child and then return to it in your later years just to marvel at the transition of your own appreciation for it. The characters, or at least the central characters, were a strange line up in a 1990’s world where everything was ultra masculine, filled with mega buff guys screaming and story-lines centered on physically fighting opponents (I’m looking at you, DBZ). There was none of that here. Don’t get me wrong. I loved me some Dragon Ball Z (that uncut and not that stuff that’s on Toonami now, I think it’s called Dragon Ball Z: Kai), but hot damn, can I not have some time away from the awesome violence? The main character is a pretty young girl that wasn’t Sailor Moon or one of the Powerpuff Girls. If I’m remembering correctly, most of the cast was female and prior to this I had never seen or been interested in anything animated like that. Usually, girls were relegated to being background characters and held stereotypes like the whiny friend that needs to be protected or the ultra tomboy, with no room for anything else in between. And main character Kiki was beyond friggin’ normal..despite being a witch that can fly that is also accompanied by a talking cat voiced by the late Phil Hartman (in the Disney English Dub). The animation, to me though, is in what I recognize as “traditional Miyazaki” form (I saw a trailer for some movie that featured this animation style and nearly sh*t myself…and then it turned out to be The Secret World of Arrietty was no where near as “polished” like what eventually came to be with the creation of Spirited Away or Ponyo). I mean that sh*t has next level shading and some more stuff, that stuff you don’t learn until like Miyazaki Style: 401 in university. I so made that up but just imagine if that was a legitimate thing. Me and my 2D Stick People would be there. Okay, now here is the real reason why this is even on my list. In a world where there was only cable television and no Starz channels to help you with your strange (what I like to call) “Stumbleupon” television, I had no knowledge that this had even existed. This caught me and started my fondness for fantasy and magical -themed entertainment. And this was way before Harry Potter mania showed up on the scene–though I am a proud Slytherin–and everybody knows that I truly credit my love of books to that series. 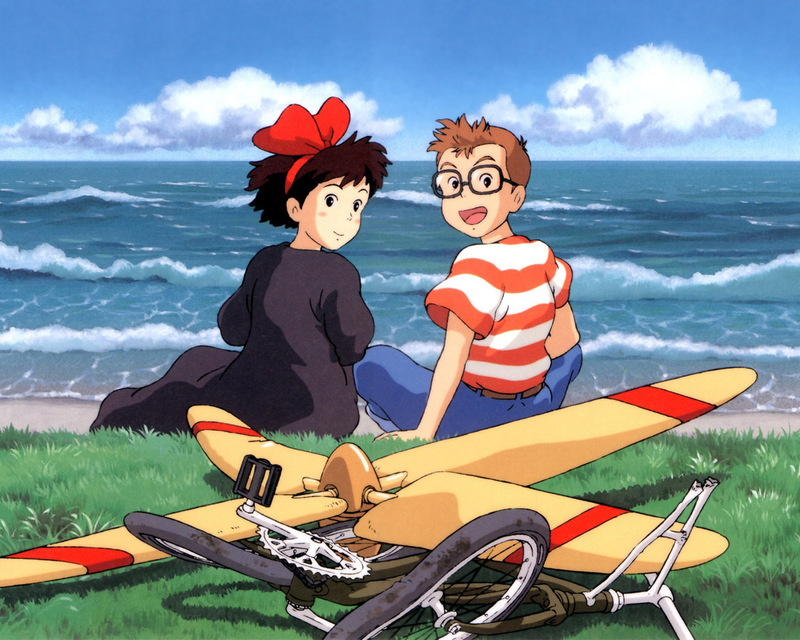 So, what Kiki’s Delivery Service did for me was to set me on a path to become pretty much who I am now, which is a lot to put on a film that came out before I was born (1989). But it’s true. If I had started with, I dunno, Nausicaa Of The Valley Of The Wind at 7 years old, Miyazaki would have been hit with that “I ain’t f*cking with you” and I would have missed out on a lot of his other works. So, for the sake of this post I went back and re-watched the film with a gaggle of my friends recently–as well as recorded the live reactions–in order to come up with my verdict. Since I feel like you can’t rank any of the Miyazaki movies on a set list and have it stand without argument, I have instead rated them individually. I knew going into this that the film wouldn’t rack up any over-the-chart points plot-wise (due to its simplicity), but it does make up for it in the significance area. With everything being about a “B” grade-wise and significance at a “A+”, that brings the average to an 8.0. Tags: Animation, Dragon Ball Z, Harry Potter, Hayao Miyazaki, Kiki's Delivery Service, Miyazaki, Movies, Nausicaa Of The Valley Of The Wind, Powerpuff Girls, Sailor Moon, Spirited Away, Studio Ghibli, The Secret World of Arrietty, Toonami. Bookmark the permalink.